Childish Gambino performs during Rihanna’s 4th Annual Diamond Ball on September 13, 2018 in New York City. Glover premiered the approximately two-minute trailer at his Pharos festival in New Zealand on Saturday. 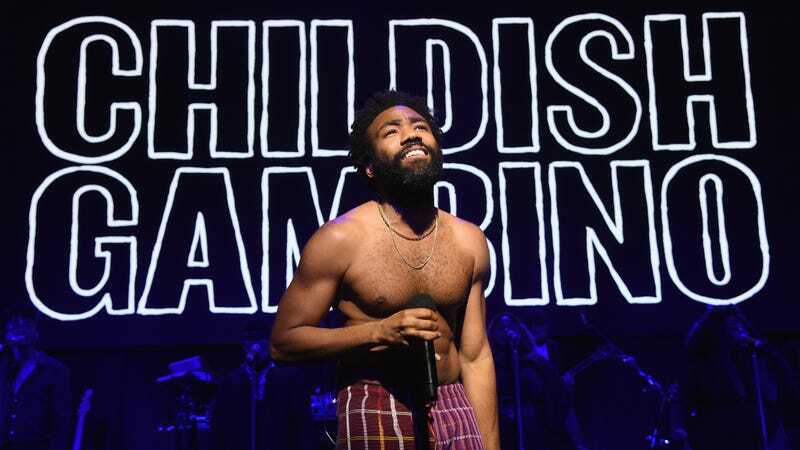 The fest itself had mixed reviews, but at least one concertgoer managed to catch the premiere of the Guava Island trailer on her camera phone, giving us a glimpse of what to expect when the film debuts in 2019. That’s about as relaxed as it gets, as the remainder of the scenes seem to capture Glover in a madcap race against time, thwarting child bandits, navigating a Caribbean or Brazilian-style carnival, being kidnapped and encountering costars Letitia Wright and Nonso Anozie along the way. Frankly, at first glance, the whole thing feels a little Black Orpheus. If so, we’re here for that. Of course, we’ll have to see more before we decide if Guava Island is a must-see for 2019—preferably in a larger format, next time?